Spring is here and it’s beautiful, but we also know that springtime weather can be unpredictable. That’s why it’s a good idea to always be prepared for the chance of severe thunderstorms that lead to the perfect conditions for a tornado touchdown. As a general rule, April and May have traditionally had the highest occurrences of tornadoes at 30% and 24% respectively, which means we are currently in the height of tornado season throughout the United States. Read on as we share some tips and information on tornadoes that can help keep your family prepared for the worst possible scenario. A tornado happens when changes in wind speed and direction create a horizontal spinning effect within a storm cell. This is then tipped vertical by rising air moving up through the thunderclouds. In the beginning of a tornado’s life, the signature funnel cloud is transparent and not visible, but it becomes visible when water droplets from the storm’s moist air condense or when dust and debris are picked up. A typical tornado can grow to be 660 feet wide and will move at 10 to 20 miles per hour, although larger and faster tornadoes have been observed. Hail and intense winds of more than 200 mph can accompany tornadoes. 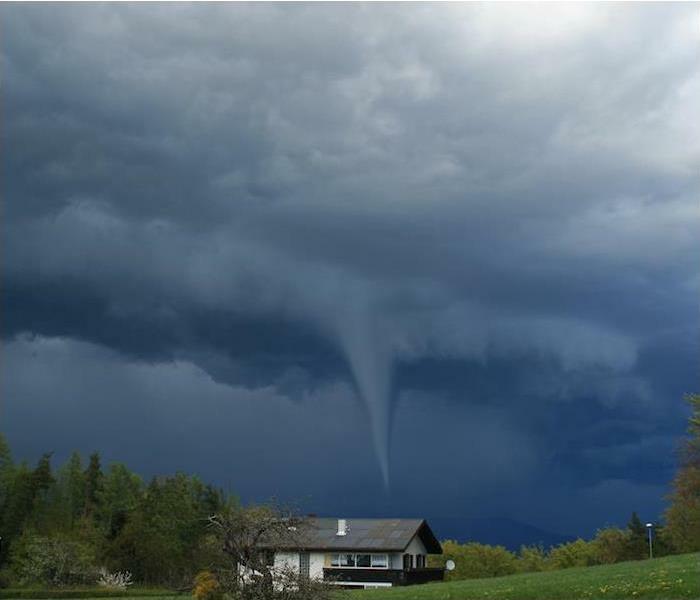 Tornadoes typically occur in the spring and summertime later in the afternoon when the atmosphere is most likely to be unstable, but it is vital to remember that they can occur anytime and anywhere. Understand the difference between tornado watches and tornado warnings. Tornado watches are issued when the conditions are favorable for tornadoes, while warnings are issued when a tornado has been reported by spotters or indicated by radar. If you are in the path of a warned tornado, it is imperative that you take action and find safe shelter immediately. Keep flashlights, a battery-powered weather radio and extra batteries handy in your selected tornado shelter at home. If you are caught in a tornado while driving, DO NOT try to outrun it. Also, when you are taking shelter in your home, you can provide additional cover by using furniture items like couch cushions, mattresses or blankets to help keep your head and neck covered. Tornadoes can create absolute havoc on the areas they touch down in. While meteorologists and weather services can provide some advanced warning to potential threats, tornadoes can still occur with little to no warning at all. If your home or business has been damaged by a tornado, know that SERVPRO® of Madison/Goodlettsville is ready and waiting to jump into action and get cleanup and restoration of your property underway. With the arrival of spring, not only are we able to enjoy the weather, but we must buckle up for the stormy ride Mother Nature may choose to send our way. Spring brings us longer days and more sunshine, but unfortunately, it also presents the threat of severe weather throughout the country. It’s dealer’s choice this time of year, which means the weather may change at a moment’s notice. With the unstable temperatures that we experience during spring, the weather can change in an hour, going from warm to cold. That temperature change can result in extreme weather changes as well. Thunderstorms are plentiful during the spring season and are the main cause of severe weather. They can occur whenever warm, moist air collides with cool, dry air, which is most common in the spring and summer. When studying natural catastrophe losses in the U.S. for 2017, severe thunderstorms were the most common and produced some of the costliest results. Out of 50 events, there were 85 fatalities and an estimated total of $25.4 billion in overall losses. They can bring about the threat of flooding, high winds and even tornadoes given the right conditions. It has been reported that in modern history, 10% of all violent tornadoes have occurred in March, with April, May and June taking the top spots at 30%, 24% and 15% respectively. While it is currently not possible to predict the weather with 100% accuracy, forecasters have the technology available to them to give us an indication that severe weather could be coming. Advanced warnings, along with the right preparation, can greatly improve overall safety for your family. Despite its unpredictability, there is one thing that always remains true of the spring weather season: It always happens. If your home or business is damaged in a storm, you can depend on SERVPRO® of Madison/Goodlettsville to get the cleanup and restoration process started fast. As a business owner, there are plenty of safety considerations to address regarding risks to your business, staff and visitors. One of the issues you need to spend a little extra time planning for and working toward is fire prevention. From those causes, three of them—intentional, exposure, and electrical distribution and lighting equipment—accounted for 20%, 18% and 15%, respectively, of the most property damage. In taking a looking at more recent numbers, the NFPA estimates that from 2007–2011, U.S. fire departments responded to an average of 3,340 fires in office properties per year, which were responsible for an annual average of four deaths, 44 injuries and $112 million in direct property damage. 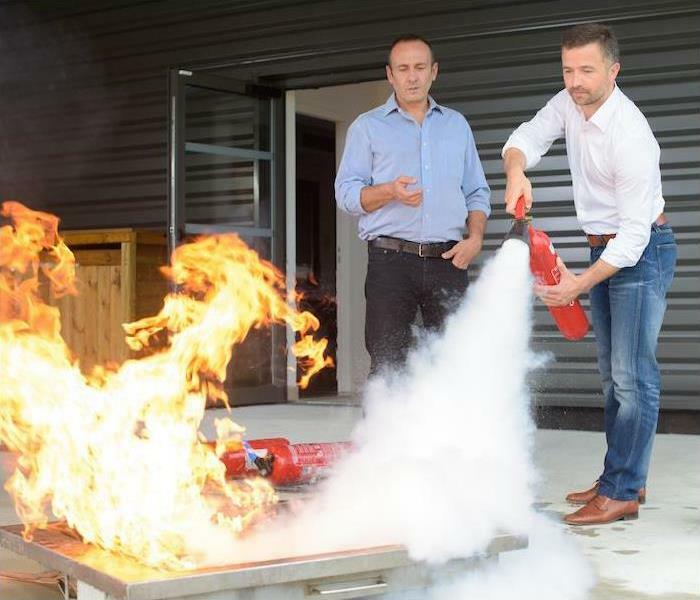 What can you, as a business owner, do to protect your business from the risk of fires? By focusing on fire risk assessment, fire prevention and staff education, you can help reduce the chance of a fire breaking out. First, you must assess your risk for fire by identifying hazards. In some areas, the local government may even offer a visit from a fire marshal to help identify these risks and provide guidance on your fire prevention plan. Finally, work at creating a fire plan and reviewing it with your staff. That way you’ll be making sure everyone knows what to do and how to stay safe in the event of a fire. Conduct fire drills at least once a year to keep the fire safety protocol fresh and take time to review evacuation plans and the location of your first-aid kits. Despite best efforts with fire prevention and safety tips, the worst could always happen at your business. If a fire has damaged your business, SERVPRO® of Madison/Goodlettsville is available to help make it "Like it never even happened." When you understand the differences in the types of water that are involved with water damage, you will be better able to deal with the cleanup. It is easy to think that all water causing damage is the same, but there are three separate classifications for it: clean water, gray water and black water. Whatever the type of water that has caused the water damage, there will most assuredly be a cleanup and restoration process to follow. To begin the process, the most important thing to do is remove all of the moisture and damp items quickly, so that mold will not begin to flourish in its ideal environment. This will be the easiest type of water damage to work with since there are fewer microbes living in the water, but after 48 hours and building surface contact, clean water can move up to category two, and “gray” water. 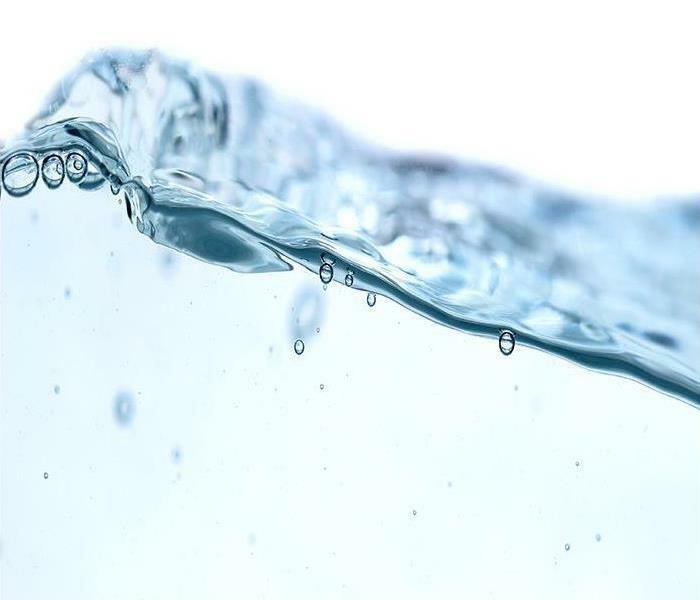 Gray water is where water damage cleanup and restoration can become a bit more complicated, and it may pose a health risk due to its containing chemical or biological contamination. That slight contamination in gray water means that it will have to be properly and thoroughly treated before safe consumption. Gray water can come from dishwashers, aquariums, showers, etc. The 48-hour exposure time applies here as well, with gray water turning into black water if not treated. Black water is the most serious of the three and is considered highly contaminated by harmful chemicals and biological matter, therefore making cleanup risky. This type of water includes floodwaters containing soil and all sewage waters. Sewage contains microbe contamination, including bacteria, protozoans, molds, fungi and more, which are hazardous to humans. All floodwater classifications are recognized by the Institute of Inspection, Cleaning and Remediation Certification (IICRC), which is an organization that certifies and sets the standards for the cleaning and restoration industries. Our technicians all study IICRC standards and best practices in water restoration and are available to help determine the steps to take to get your home back to normal. It doesn’t matter what type of water has caused damage to your home or business, SERVPRO® of Madison/Goodlettsville is here to help get the situation under control and make it "Like it never even happened." Don’t hesitate to reach out to us if you need emergency cleanup and restoration services! Fire damage in your bedroom or any part of your home can cause some stress. Contact SERVPRO to remediate and restore your damaged property. If your Nashville property suffers fire damage, quick action is crucial. Not only does it help to limit the damage inflicted on your home but it can help to lower the cost of restoration. In case of a fire in your home, you need to stay calm. Doing so enables you to act rationally. Also, you get to take the right steps to minimize damage and losses. The first step homeowners should take when faced with fire damage in Nashville is to call the insurance company. As an important step in the insurance claim process, the insurance adjuster inspects your home to determine if you are qualified for a claim. Also, the adjuster comes up with a budget for the repairs and replacements to be made in your home. It is important to inform the insurance adjuster of your intention to have the home cleaned by fire clean up and restoration experts. As experts, we are in a position to mitigate the damage in your home. Not only can we save your valuables from absorbing smoke but we can help you get your life back on track. Before we start the cleanup and restoration process, you must sign the work agreement. This gives us the go ahead. We use your insurance adjuster’s budget as a guide to clean up and restore your home. SERVPRO experts arrive at your home with the right equipment to safely deal with the damage. The first step we undertake is scoping the structure. We do so to identify any potential dangers. Before clean up begins, we salvage any of your valuables for professional cleaning. Later, we clean up your home to the preloss condition by removing smoke residues. If your valuables or parts of your home are damaged badly and cannot be restored, we dispose of such items. SERVPRO fire damage experts use thermal foggers or wet foggers to deodorize your home and remove the smell of smoke. By doing so, we leave your home smelling like a flower. Afterward, we compile an accurate fire damage assessment report which we hand over to your insurance adjuster. By doing so, we fast-track the insurance claims process finally getting your life back on track. 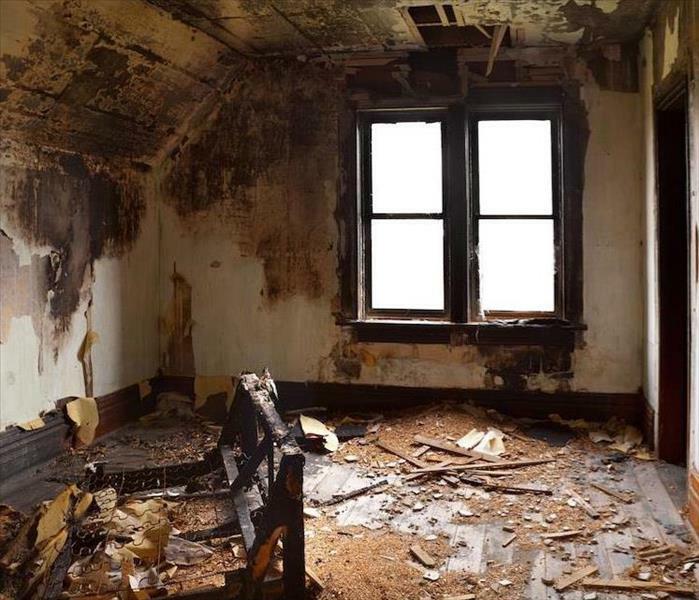 The team at SERVPRO of Madison / Goodlettsville has extensive experience in fire damage and restoration services. For professional and timely cleanup services, call our 24/7 emergency line at (615) 868-5324. By doing so, you get to save on restoration costs. SERVPRO of Madison / Goodlettsville has what it takes to mitigate flood damage "Like it never even happened." When flood damage strikes a property in Nashville, the results are typically too much for homeowners to handle on their own. Professional restoration services like those provided by SERVPRO can help bring a home back to the way it was before a flood, but many homeowners are afraid to bear the costs and responsibilities associated with a full-scale restoration project. Unfortunately, few if any symptoms of flood damage go away without appropriate care and attention. Our recommendation is to call for help as soon as damage strikes, or else these long-term effects could begin to develop in your home. Long-term exposure to standing water and excess moisture produced during flood damage events in Nashville can cause permanent and expensive damage to the very foundation of your home. All common foundational materials, from masonry to concrete to stone, can absorb small amounts of water through cracks and pores in their material. Unless these pockets of water are removed with specialty drying equipment such as the air movers and dehumidifiers used by SERVPRO, they can create faults in the building foundation that eventually destabilize the entire structure. Fast and thorough drying processes are the only way to protect your home against these threats. Mold loves moisture, and without an expedited drying plan, your home is likely to retain much water in the aftermath of a flood. 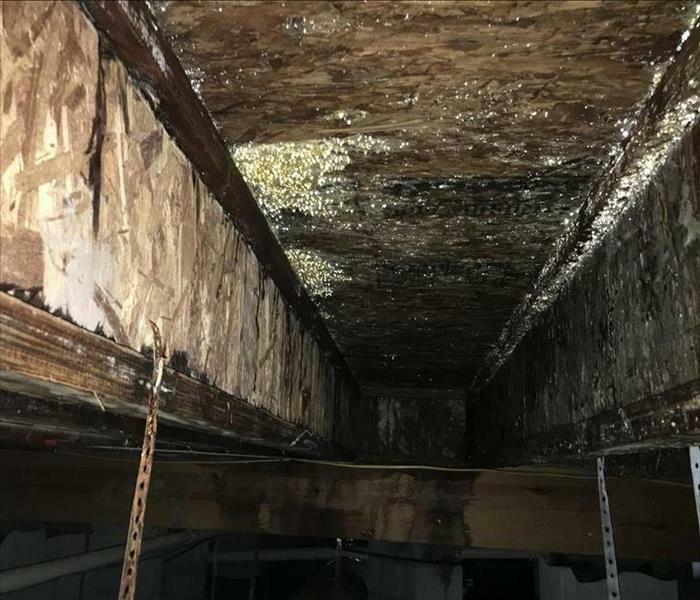 While most residential mold problems remain isolated to a single room or area, floods often create fungal problems that span across the entire home. Preventative treatments can help, but the only definitive solution to developing mold problems is rapid drying and dehumidification. Over time, many materials tend to dissolve, break apart, and otherwise degrade when inundated with water. Again, the best way to mitigate damage is to enact a comprehensive drying plan rapidly, but specialist companies like SERVPRO can also provide vital restorative treatments to most parts of your home even if they are in an advanced state of disrepair. SERVPRO of Madison / Goodlettsville can begin an industrial-scale drying process in your home within hours of your first call. Contact us at (615) 868-5324 for 24/7 help and services. For more on Nashville, click here. What?? The Dishwasher Flooded Your Nashville Kitchen and More--Does SERVPRO Know? After water floods your property, various problems can develop due to the excess moisture, among other things. Common signs of problems include musty odor, changes in the texture of walls, floors, and ceiling as well as discoloration of different surfaces. By taking proper remediation steps in time, it is possible to address such problems before they reach uncontrollable stages. We offer broad restorations services that can help your property bounce back from the water loss "Like it never even happened." Some cases of water damage in Nashville originate from the same appliances meant to make house chores easier when they leak water into the property flooding it. Simple problems with the washing machine, refrigerator or dishwasher can leave you with extensive water loss. Problems with dishwashers in particular present various problems including backup caused by food and other debris build up or problems with the supply and discharge lines. How long it takes to start the restoration steps, once the problem is detected may determine how severe the problem becomes. Having the emergency contacts of a professional restorer like SERVPRO helps ensure the response is timely. If the loss originates from a faulty appliance, our technicians can also inspect the other appliances in your house to establish if there are faults that can cause further leakage. Fast extraction of any standing water from the affected area is essential. Extracting more water reduces the amount of effort or time spent drying the property because moisture elimination is faster in a liquid state. Our SERVPRO technicians use different types of extraction equipment and pumps to remove the water. After eliminating the water pooling around, drying the property using dehumidifiers and air movers helps bring down moisture levels to preloss conditions. This final step helps prevent stubborn problems such as mold development. Cases of water loss should not get out of hand. Call SERVPRO of Madison/Goodlettsville at (615) 868-5324. Nashville businesses deal with possible disasters year-round; water being the driving factor behind many of them. Nashville businesses deal with possible disasters year-round; water being the driving factor behind many of them. Regardless of the source, weather-related or failed plumbing, every owner needs a professional restoration service to ensure he can reopen for business as soon as it is safe to do so. Most Nashville commercial water cleanup results from a plumbing issue. In a typical office setting like a large accounting firm, the source is often from a sprinkler system. When the fire turns out to be smoke from a plastic cup microwaved too long, SERVPRO response teams understand that the solution for a fire has become a problem all its own. In a situation like this, cleanup and removal go from floor to ceiling. An accounting office, if it does have carpets, uses a commercial variety, which usually means no pad underneath. That makes removing water a faster process for our technicians. They can use pumps, to begin with, and then switch to extraction wands to draw the remaining water from the carpet. If the water sat for more than a day or two, or if the water absorbed a large amount of ink from paper and finishes or paint from furniture, SERVPRO specialists may have to use a shampooer to thoroughly clean the carpet and prevent stains from setting in the nape and become permanent. As team members clean carpets in some rooms, others examine damage to walls. Most paneling resists water fairly well, but the drywall behind it can begin to crack and degrade if it absorbs too much. If this happens, our teams recommend immediate removal and replacement. When the drywall is merely damp, we can use a combination of fans and air movers to dry the panels. Specialists place the fans at exit points to draw the damp air outside of the business. Next, they set up the air movers to force warm, dry air across the affected surfaces to carefully remove moisture. Finally, there are the drop ceilings. The tiles under and close to the sprinklers absorb an incredible amount of water in just a few minutes and quickly turn brown and yellow from the absorbed moisture. Since most ceiling tiles are inexpensive, it is cheaper and quicker for our teams to remove and replace them instead of spending the labor hours and cleaning/bleaching agents to try and restore them. Our goal here at SERVPRO of Madison / Goodlettsville is to help you start serving your customers again as soon as it is safe. If you need to schedule our services or have a question about what we do, call (615) 868-5324 today to get started. Nashville Cats and Houses Hate Water (Damage)--Call SERVPRO --"Like it never even happened." Problems with water occur across the country a lot more frequently than you would ever realize and even your home in Nashville is at risk. 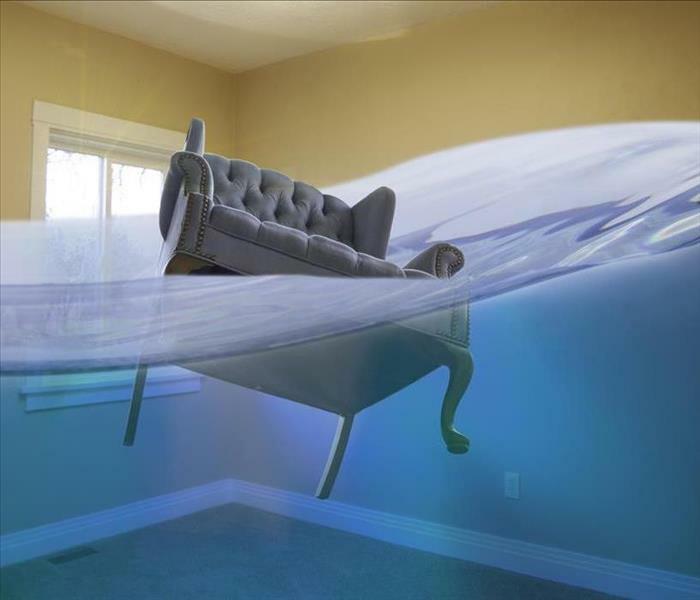 The second most regularly filed insurance claims in the U.S. are water damage claims. There are several ways that water can negatively affect your house including pipe breaks and broken appliances. If a water pipe running through your building gets only an eighth inch crack in the pipe, approximately 250 gallons of water per day or over ten gallons per hour can flow into your dwelling. Excessive moisture can also cause numerous other issues with a structure, which means that about 20% of all insurance claims filed are related to water damage of some kind. 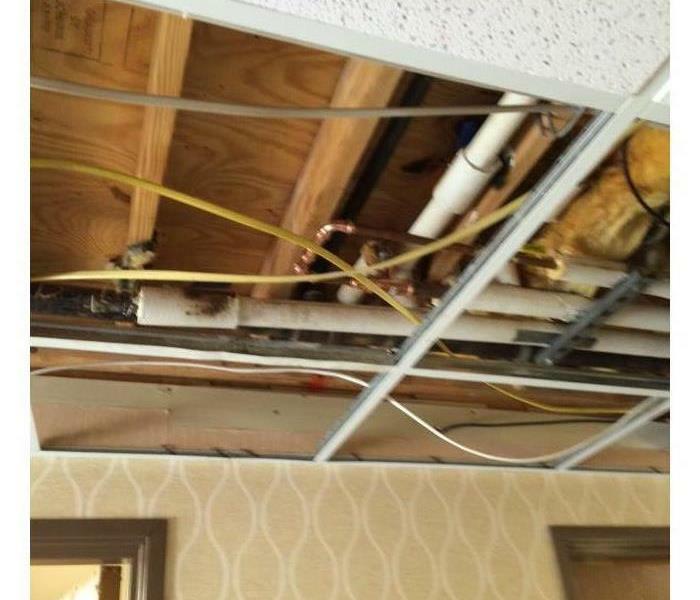 Once a pipe breaks, calling in a professional mitigation team like SERVPRO is essential to reduce the severity of the issues. Once a mishap happens to your home in Nashville, the water damage can get worse and worse the longer it sits there without being treated. After 48 hours, moisture can cause mold to start forming, making the overall situation much more severe. Therefore, our team tries the best we can to remove moisture within that 48-hour period so that you do not develop fungal problems. Air movers and dehumidifiers can help speed up the natural evaporation and drying process significantly. The air movers keep the wet air moving away from the damp surface so that water will not stop evaporating from the solid material. The dehumidifiers then remove the water from the air and dispense it into your sewage drain in liquid form. The machines then pump out hot, dry air so that the air movers can use it in its circular air flow motion. Refrigerant dehumidifiers LGR's push wet air across cold coils so that the water vapor cools and condenses. Desiccant dehumidifiers pull damp air across a silica gel that absorbs the water molecules. The machine then pushes hot air past the silica so that it removes the water from the silica. If our SERVPRO crew does not set up enough dehumidifiers, then the air movers will push around the wet air and problems can arise in other places meaning that secondary damage could take place. Improper placement and use of dehus can actually result in "indoor rain." If there are too many dehumidifiers compared to air movers, then the drying process may not be as fast as it could be. 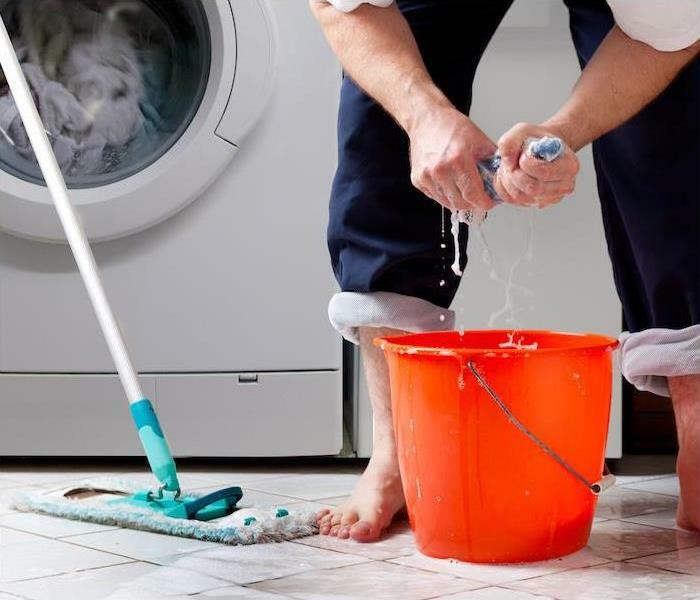 If you ever find yourself in need of filing a water-related insurance claim, call SERVPRO of Madison / Goodlettsville at (615) 868-5324 24 hours a day for help with the recovery of your property. Nashville Crawlspaces Benefit from SERVPRO's Mold Remediation and then Encapsulation. Call for a Consultation. Nashville homes deal with water problems every year, but they often miss what can be a follow-up disaster. Usually, dormant spores become active and proliferate through a home after they absorb enough moisture. A large share of Nashville mold damage starts behind walls and under the feet of homeowners. SERVPRO restoration teams often find themselves pulling down walls and crawling under homes to find the source of the problem. In cases like these, the mold usually grows over surfaces, but it can dig into drywall and even the framing behind it if not caught quickly. While drywall is easy and cheap to remove and replace, wall framing can be more difficult. Technicians often have to scrape mold from the surface, and if the spores went deep, they could sand down the surface to remove the infestation. Wood studs can also be sprayed with an antimildew product after removing the mold and hyphae. To reduce the risk of mold growth and contamination, SERVPRO recommends encapsulation for crawlspaces exposed to water. Team members start by examining the concrete walls for leaks and seeps. If they find one even as small as a pinpoint, they use hydraulic cement to seal them against further water intrusion. Other specialists level the dirt floor to prevent pooling and then cover it with heavy, polyethylene sheeting. If needed, they use wood framing to hold the sheets in place. Next, they secure the ends of the sheets to the now sealed walls with a polyurethane caulk or a specially designed, two-sided, foundation tape. Team members continue using polyethylene sheets to seal off the walls. They secure them with the same caulk and tape and also use more wood framing for additional support. After completing encapsulation, specialists use a moisture meter to determine if the humidity levels are at an acceptable level. If needed, they can use a dehumidifier to remove water from the air until the level measures as normal. To keep the humidity down, team members can leave a container of desiccant material to continue absorbing moisture. In extreme conditions or environments, a permanent dehumidifier can be installed in the crawl space. Less moisture means less chance of mold growth. The encapsulation also limits food sources for mold spores to develop into large colonies. Our goal at SERVPRO of Madison / Goodlettsville is to bring each home back to a clean condition. If you are still dealing with effects from the last storm or flood whether the result was mold damage or not, contact us at (615) 868-5324 today to begin the restoration process. 10/2/2018 - What?? The Dishwasher Flooded Your Nashville Kitchen and More--Does SERVPRO Know?